Rates available in the date picker below are valid at the time of booking but may change for some busy dates. Book below to secure a place. Availability: daily, Apr 19 to mid-October 2019. Check the calendar below for available dates and book yourself on a small group tour right now! Meeting point for scheduled public walks: Julia Child Bistro, 10:30 am. Yet, for a private tour we’ll meet you at your hotel, any time. This is a Peter's walking tour as it was when it all started in 1996. How does it work? Turn up, meet the guide and the fellow walkers. Make your requests for the route. It can be anything like “I’ve just arrived and want to get my bearings” or “could we talk about the Siege of Leningrad, and also visit a Russian church”. Or, “show me good places to eat, and how to use public transport”. The guide puts all the suggestions plus his own ideas into a plat du jour. The walk will most likely include*: Dostoyevsky and his Crime and Punishment, St Nicholas church, 18 century canals, bridges and backstreets of the historical Kolomna, the Mariinsky Theatre (without going inside) and the addresses of associated celebrities, New Holland, the English Embankment, the Senate square and the Bronze Horseman, and much more, possibly a detour to the Troitsky cathedral and market or even a visit to Vasilievsky Island with its many delights. *Exact route must be discussed with your guide. No two walks are exactly the same. What is it all about then? 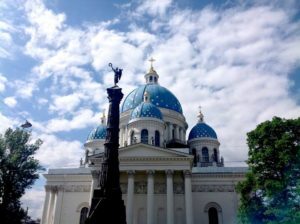 Our main idea behind this tour is that St Petersburg is much more than a collection of gilded palaces and cathedrals. A huge metropolis living its own unique life, it is a complicated mechanism in which you, as a short-term visitor, will have to function for a few days. We help you find your way around, introduce you to the various aspects of its history, culture, modern life. Imagine you’re hosting a visitor from a different country and show him around your city – that’s what it is. 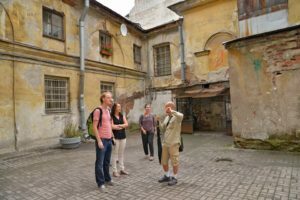 This walk, however, should not be seen as a way to quickly “do” all the tourist attractions – we do not visit the Church of Spilled Blood, the Hermitage or any other museums. For any of that consider booking a customised private tour with us. GREAT VALUE: it’s a 4-hour walking tour for only around 22 USD! So much more than just pointing out a few buildings and naming a few big names, The Original Walk is a headlong plunge into the cultural environment of one of the largest cities in Europe. Make the most out of your stay with the help of Peter's Walking Tours. This tour can also be booked privately. Contact us info@peterswalk.com.